DOORCO Ltd is once again raising the bar with the launch of a fully comprehensive online customer support package that is set to transform how the sector sells. “Working as closely with our customers as we do, we identified a need to make the process of generating leads, creating orders and ultimately selling more doors, even easier,” explains Ben Aspinall, DOORCO’s IT & Projects Lead. 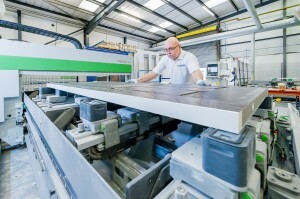 “Which is why we commissioned specialist development company, The Consultancy, to develop unique online customer packages, not only for our fabricator customers, but for installers too. “Our fabricators can already order directly with DOORCO online, but this new package helps them do business with their customers online too. At the first level, our fabricators can now utilise our DOORCO door designer to power their own bespoke online ordering systems and door designers. This means their installer customers can generate instant quotes and orders from them directly via individual trade portals. Our fabricators can also provide their own version of the door designer to their ‘full door set’ customers to assist selling more doors online or closing the sale in the field. The whole system allows homeowners to design, quote and order doors online via Door slab and prepped slab fabricators and their installers. “We haven’t stopped there though. 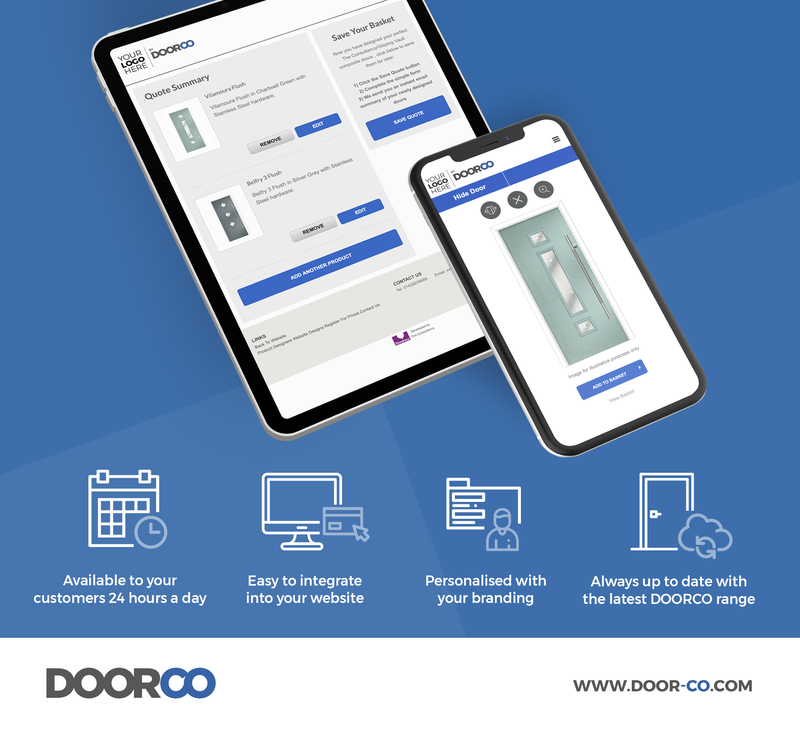 We’ve also launched a stand-alone installer package to allow installers direct access to the DOORCO door designer, that can again be individually branded to their business and used on their website, or within their own business. “In addition to this, on the DOORCO website at www.door-co.com, we also offer homeowners a door designer facility that allows them to browse the style, frame, colour, glass, and hardware options they’re considering and see them come together in the final door design, before they request a quote. These leads are then distributed to our fabricator and installer customers. “The Consultancy holds all the data and images for the latest DOORCO range on file, therefore whenever a new product, colour or design is added to our portfolio, it is seamlessly integrated into the customer’s software. 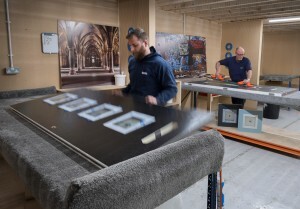 “Introducing a full supply chain ordering system like this, that fits in with our existing online ordering systems, makes the entire process more efficient, more secure and more convenient, but most of all, door designers such as these generate more leads and more sales, which is precisely the kind of support we want to offer DOORCO fabricators and installers. DOORCO is pleased to report that its 4 Panel Pre App door slab takes second place in the popularity stakes with fabricators thanks to its flexibility and simplicity. In a time when efficiency has never been more important, the product ticks all the boxes, genuinely saving time, money and wastage, as well as being able to produce around 60% of all traditional door styles, from just one slab. 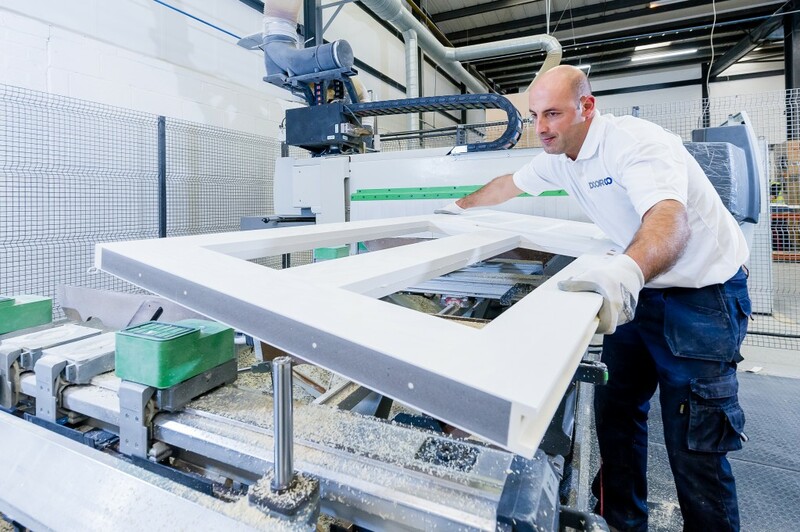 Dan Sullivan, DOORCO’s MD explains: “The well thought out design of the 4 Panel Pre App door slab has made it one of the most popular choices amongst our fabricator customers for producing traditional doors. This is simply because it is one of the most versatile products we offer – in fact 60% of all door styles can be made using a 4 Panel Pre App slab. Rather than a woodgrain solid slab, customers opt for the 4 Panel Pre App as it has apertures created during the manufacturing process which makes a substantial impact on their fabrication process. Each door will shave 49 seconds off the CNC machining time and produce significantly less wastage, meaning they save on both labour and skip hire too, all of which results in genuine financial savings across the board. “As well as pre-cut apertures, the 4 Panel Pre App has a removable rail which makes it even more versatile. Fabricators can easily manufacture five of our most widely produced designs – standard four panel designs such as Penina, Carnoustie and Birkdale, and half lite designs such as Lytham and Lytham Grid – all from just one slab. The 4 Panel Pre App is available with seven colour choices on next day delivery, or coloured in any premium colour, RAL or stain and delivered in five days. “In the world of manufacturing we are all looking to save time and money and the 4 Panel Pre App is aimed at doing just this. In our own state of the art prepping facility, we have we have saved thousands of pounds on waste disposal, which we have been able to pass on to our prepped door customers. We want to make sure those who fabricate composite doors are aware that they could achieve the same cost savings. Dan Sullivan, MD of leading composite door supplier, DOORCO, reviews the bold service statements the company has made this year and explains to Glass News what’s been happening behind the scenes to make it all possible. In today’s hyper-connected world everything is accessible immediately and customers expect better service than ever. In a recent survey of customer service leaders, it was found that 66% of customers switched brands because of poor service. This is something we never want to happen and why DOORCO has taken the market by storm with bold promises that challenge the status quo. Customer service is very much at the heart of everything we do. 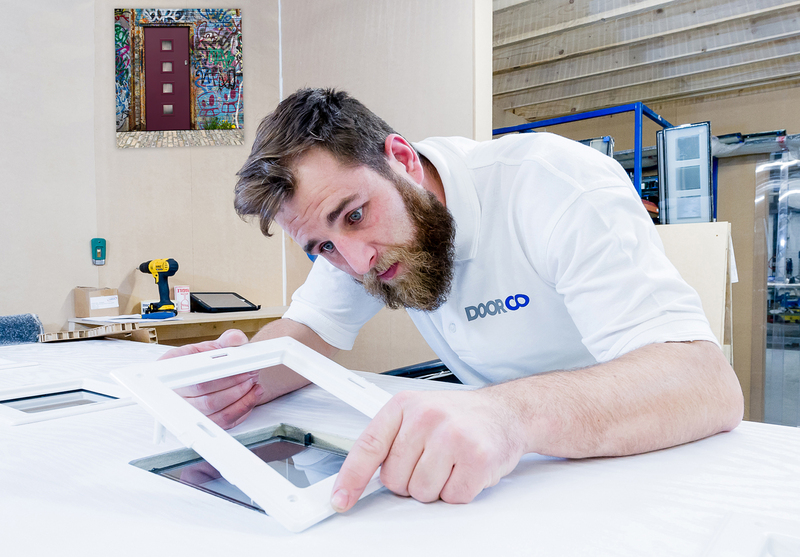 Every person in the DOORCO team understands that and works hard together to focus on just one thing – meeting the needs and expectations of our customers. By making such a bold statement to the whole market through advertising, there was no way we could fail and this made us even more accountable. We’re now over six months on and we’re delivering against the five points of the charter 98.3% on time and in full. Everyone at DOORCO has been instrumental in making the charter not just achievable, but successful. The results are happy customers, happy customers’ customers and of course, increased sales of composite doors for everyone. We’re not stopping there: our service philosophy goes above and beyond our Customer Charter because our core strategy lies in the scope of the service we offer. My biggest personal dislike is the word “no” or “can’t”, so when it comes to our own customers, we never want to say those words. Our prepping service is a good example of this: it comes with no restrictions. DOORCO customers can order any slab, design, colour, glazing cassette and glass combination to be delivered in three days, prepped for any lock, hinge, door furniture, opening configuration and they can even choose whether the edgebanding is painted or not. It is not governed by protocol and we don’t tell our customers which products can be used on our slabs. Our intention is to be as helpful as we possibly can with our can-do approach. We also offer a specialist glazing service which means we can supply doors pre-glazed using the Urban, TriSYS or Inox cassette systems, within three to seven days depending on the complexity of the design. For the past few months, we’ve been working hard behind the scenes to make sure we don’t suffer the pains of growth and end up making empty promises to our customers. Our focus is on efficiency – speed and service without any compromise on quality – as we continue our strategic growth plan, investing in not only in machinery, but also IT and People. Everything is undertaken with a combination of thought, planning, commitment and of course, the skill of our team to deliver. We have put a lot of effort into streamlining our manufacturing processes and increasing our prepping capacity. We are now running two state of the art, custom built Schubox paint lines. We’ve also added a new Biesse Rover A-1632 processing centre, taking our total CNC machine count to four. Relatively new to the market, the precision, quality and speed of this machine is seriously impressive. This latest round of investment is to support future growth and will hopefully result in us being able to update the 2019 Customer Charter with even faster turnarounds – just because we are delivering as promised and quicker than most of our competitors, we certainly don’t want to stand still. And while we’re striving for improvement, we’re determined to keep our eye on the basics – the DOORCO team are working hard to ensure we continue to deliver, so this investment is also about supporting them with the best tools to do their jobs. With DOORCO it is never a “no” – we don’t make empty promises or impose protocol. 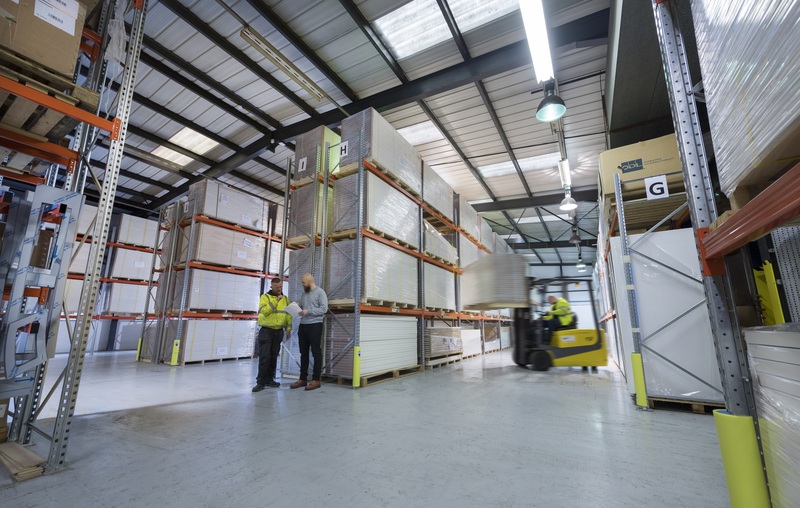 We are focused one thing – meeting the needs and expectations of our customers and our fully flexible prepped door service is the perfect example of meeting this aim. Why not come and see for yourself? Our door is always open – we welcome any new potential customers is to visit our facility, meet the team, see the quality of our products, and understand the benefits of working with a supplier that has a can-do approach. For more information call: 01625 428955 or visit: www.door-co.com. 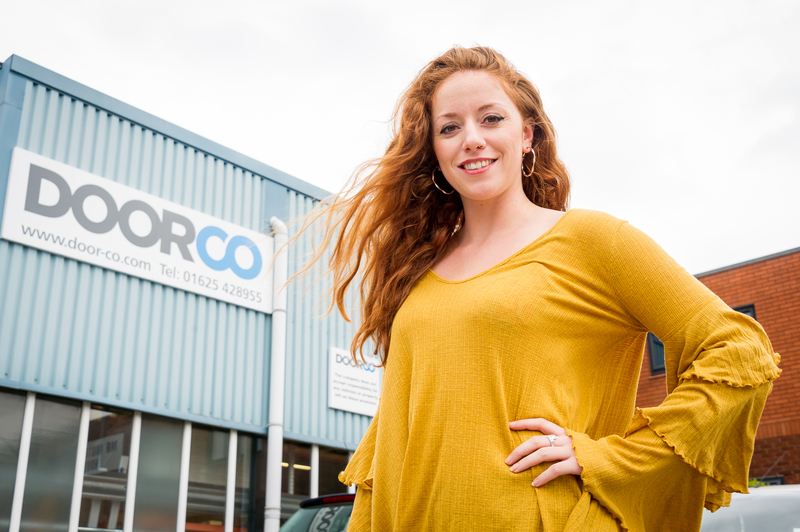 Recognised as one of the UK’s most innovative composite door manufacturers, DOORCO is once again demonstrating its leading-edge approach to supply with the appointment of a Creative Consultant. Jeyda Heselton, a self-proclaimed DOORK, is teaming up with DOORCO as their Creative Consultant to add a new dimension to the company’s already innovative range of products, designs and marketing collateral. 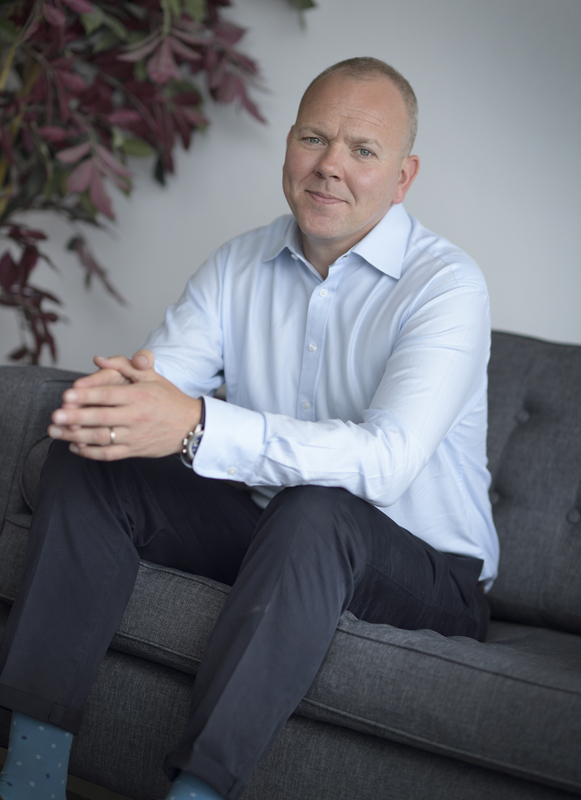 Dan Sullivan, MD talks about the appointment: “DOORCO likes to push the envelope when it comes to innovation, whether that’s with our products, designs or marketing. We have some unique products in our portfolio but getting fresh inspiration for this is often challenging. While we can clearly see trends and growth areas through our own sales, we are often quite far removed from what is happening ‘on the street’ because we are simply a component supplier. This is why I was so intrigued by a news item about “A girl obsessed with doors” shown on the BBC back in February and on further investigation, the images she posts on her Instagram channel @knockinondoors. Jeyda Heselton comments: “Doors are a passion of mine. There’s something fascinating about a door – common to all people and yet they can take so many different forms. The colours, sizes, textures, features and surrounding area all come together to something completely unique. I love to spend my spare time on door walks – basically walking around my home town of London taking photos of doors and then sharing with the very large online community of doorks – but who knew it would lead to meeting up with one of the UK’s leading composite door suppliers and being appointed as their Creative Consultant. 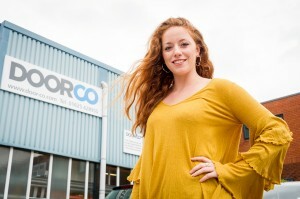 I am delighted and very much looking forward to working with the team at DOORCO to help define the future of doors. DOORCO Ltd is expanding their colour range with the addition of seven new colours that will shape the front door market for the rest of the year. Jayne Sullivan, Operations Director comments: “The main topic of conversation continues to be colour in all areas of the home improvement market. Whether it’s interior or exterior, homeowners are becoming braver in their colour choices and this ‘trend for bold’ is fast extending to front doors. As one of the leading composite door suppliers to the UK market, it is our job to make sure we are doing all we can to keep our customers ready to supply the homeowner with what they want. That’s why we have introduced seven new, fashionable colours into our already extensive range of 38 standard colours. While we continue to match any colour, by adding these seven colours to our standard range, we’ve made them available on a short lead time of just five days. 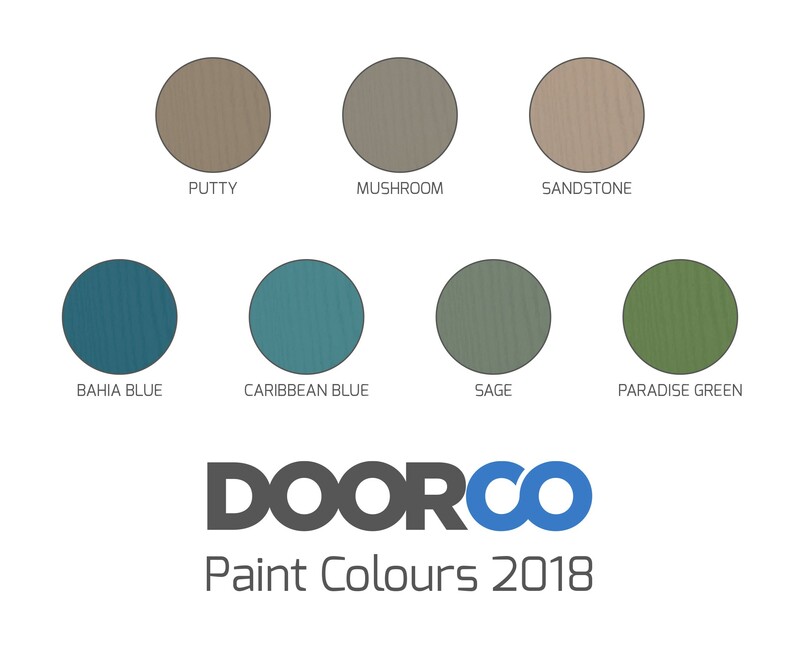 These new colours include darker blues and greens (Bahia Blue and Moss Green), bolder shades like Paradise Green and Caribbean Blue, coupled with the earthy and classic shades such as Clay, Mushroom and Putty. PS The new colour range is included in our updated brochure which is available now. DOORCO’s new specialist added-value Glazing Service, which offers to take the pain out of glazing doors, particularly for the growing contemporary market, hit 100 orders in just a matter of weeks and some major contacts in the pipeline for the last quarter of the year. “As the popularity of modern door designs soars, so does the complexity of the components and skill-sets required to create the ultimate contemporary door,” says Dan Sullivan, DOORCO’s MD. “While many of our customers have the desire to introduce the flush finish of the Inox or Urban cassettes, the installation can often be complicated and time consuming and doesn’t always justify the additional resource required in their fast-paced manufacturing processes. This is why DOORCO chose to invest in our own glazing service which has specialist equipment run by a dedicated glazing team. We are delighted that it seems to fit the bill for many of our customers, both large and small. “Enquiries so far indicate that Inox is the most popular choice for our customers. It looks great on a flush slab thanks to its high-grade stainless-steel flush fit exterior that sits just 3mm from the door surface. Tri-SYS, while simple to install, is also prevalent as customers opt for ease, which is exactly what this service was aimed at. Offering a more traditional raised profile in a woodgrain finish, Tri-SYS gives any of our designs a more conventional feel. The third option is Urban – a combination of thermally broken aluminium and PVC-U, available in a woodgrain or smooth finish, in a range of colours including an anodised finish. Urban looks great on LINKS, really creating the ultimate contemporary door. “We’ve also made the ordering process even easier by adding a new, bespoke door designer to our website – a customer’s design can be sent directly through to our ordering system and delivered from as quick as three days. Jayne Sullivan, Operations Director at leading composite door supplier DOORCO Ltd talks to Glass News about how fashions in interior design can’t be ignored when looking at where the door market is heading next and how colour and style must be prevalent in supplying the end customer with the lifestyle choices they desire. One of my favourite tasks is to flick through the monthly interior design magazines I subscribe to. It’s not about gaining inspiration for my home but seeing what the experts are talking about and the key trends emerging – after all the front door of a house often reflects the style of the home within. And as we all know, what’s ‘hot’ inside eventually filters through to the exterior. It’s about recognising that our products are essentially a lifestyle choice and for DOORCO, it’s this attention to detail that drives our innovation. In fact, it was the main inspiration behind this magazine’s cover which is a taster of what’s to come from our new brochure. The main topic of conversation continues to be colour, and there are some very prevalent themes emerging. While grey may still be the neutral of choice for many interiors due the timeless and classic look it provides, colour choices are bolder – grey is evolving as we see a significant shift towards lighter greys such as Traffic Grey and Slate, but also blue and green tones coming through especially with colours such as Moss Green, Basalt Blue, French Blue and Stormy Seas. Of course, the experts are often braver in their design than many homeowners but we can all pick the elements we like to introduce into our homes. It seems the style is all about rich pigments and moody tones. Dark blue walls and dark furniture, furnished with a touch of colour and texture. Interestingly tropical trends are still popular, but instead of carnival bright colours, it’s about mixing greens and bold leaf patterns. I have to agree that rich shades of green look striking against the navy or charcoal walls that are so fashionable. It is gratifying when browsing through what the top designers are saying, that their styles are aligned with where DOORCO is going next. For us it’s about delivering these lifestyle choices, and whatever the homeowners’ tastes are, we as an industry, should be offering doors that are on-trend and accessible. We already have the widest range of designs, and customers tell us, the best looking composite door finish in the market. But as we evolve, we need more than just “traditional” or “contemporary” to define them with and more than just pictures of door fronts or lines of SKUs to provide broader inspiration. In the initial stages of designing our next brochure, instead of just incorporating our new products, colours and designs in to our original one, we felt we needed to do something different. Our current brochure seems to have become the template for many, which is not surprising as it is comprehensive, well-structured, well laid out and our customers love the fact that it can be easily wrapped with their logos and colours – it’s a fantastic and cost-effective sales tool for them. But as a company brochure for DOORCO, it was time for an overhaul. Innovation drives everything we do – our products, our services and our marketing. That’s why our new brochure design is quite different from anything our industry has seen before. We’ve invested in photography to make sure the brochure and accompanying marketing campaigns have maximum impact, all of which will be available for our customers’ own marketing portfolios. But of course, it’s not just about clever marketing, there has to be substance behind any strong campaign and we always start with the product. The cover advertising gives you a glimpse of our new lifestyle collections – Metro, Rustic, Classic and Deco – and we’ve been working with our paint suppliers to develop new colour palettes that reflect these changing tastes. We may have exaggerated the settings but they’re stand-out for a reason – to show that we can provide a design inspired door for every home in every location. We have introduced 8 new colours into our already extensive range of 40 Premium Colours in order to stay ahead of these trends. There are darker blues and greens (Bahia Blue and Moss Green being my personal favourites), bolder shades like Paradise Green and Caribbean Blue, coupled with the earthy and classic shades such as Clay, Mushroom and Putty. Each palette is designed to support the on-trend lifestyle choices that consumers are making today and is backed up by suggestions for hardware, glass and glazing too. In addition, the new brochure will feature popular RALs with a bespoke take on classic colours like Ruby Red (3003), Crème (9001) and Graphite Black (9011) which align to popular aluminium profiles. And we don’t stop there. We pay close attention to the finer details too, including supplying painted drip bars and co-ordinating edgebanding for doors that open-in, to match any colour choice. It’s often these finishing touches that make all the difference to the completed look – the seamless integration of a front door into the rest of a property’s design, both inside and out.